The industry changed so aggressively over the past five years. Some attribute it to the writer’s strike of 2008. The strike in which the writers won the battle, but lost the war in many ways. A recent Vanity Fair article pointed out this moment as the time when Hollywood stopped conclusively their old tradition of going mad over spec sales. Others attribute this recent revolution to new and emerging media, a shrinking economy, or a myriad of other things that got in Hollywood’s way. One thing’s for certain: Things are quite different these days. Not only for writers, but also for the people who represent them. Last week, over a casual lunch at a Sushi restaurant in West Los Angeles, a manager friend and I talked writers, as we have since back in the day. It makes sense: We met during my ScriptShark days. Writers are what we have in common. The people that occupy many hours in both of our days. We talked about how it used to be way back when: Once upon a time, there were TV writers. There were film writers. There were writers who started out in film, couldn’t get a job, so they went to finish their career where they could still be hired, i.e. TV Land. Boy, have things changed. With Aaron Sorkin, Joss Whedon and JJ Abrams to name a few, TV became quite the respectable place. In today’s climate, a successful writer is one who can effortlessly move between formats. “If they’re smart,” my manager friend said writers looking to break in are “writing in every format they can.” Why is that? While there are more writers, there are less opportunities these days; the more opportunities and formats you create for yourself to be noticed, the better your chances are at building a career. According to my manager friend, in this day and age a writer just can’t afford to dedicate themselves to one format, while ignoring another in which opportunities just may exist for them. You have to be ready to put your voice on display in every format you can, so that fans such as production and development execs can turn to you with any opportunity in every format for which you might be a match. Something happened over the last five years that many don’t want to acknowledge: The fees that writers receive for their work, be it writing assignments or selling screenplays written on spec, have gone down significantly. If before an average screenplay sale brought in about half a million Dollars, now they are selling that same screenplay for half of that. But the time required from representation to make the same sale is often double that which it used to take back in the day of hot spec sales, when a screenplay would go out on Monday morning, and have sold by week’s end. Gone, too, are the days when ample writing assignments were available, ripe for the picking, available for both A-Listers and brilliant novices. Now, complain my agent and manager friends, studios have their trusted lists of a dozen writers they know they can count on for a stellar job at affordable rates. So the days of landing hefty writing assignments are in the past as well. Back at my lunch date, my manager friend, too, went on to elaborate: “I had one writer whose spec got a lot of heat at Universal. They wanted to see everything he had for TV. That was an opportunity we couldn’t let pass. If he didn’t have a TV Pilot ready to go, that would’ve been money left on the table.” That’s not the only way it works. That very same management company had a good year on The Black List in 2012. It was how they got a handful of their writers some attention on the TV side, and ultimately went on to get a handful of writers staffed in writer’s rooms. Some say that maybe reps will have no choice but to raise their rates, from 10% up to 15% if only to make up for the disparity brought on by recent changes. No one has made the move yet, but everyone is watching to see when and if an agency or management company will have no choice but to step up and raise their rates. One thing became abundantly obvious from this series of meetings I had: Things in the representation game have undoubtedly changed. Everyone is hanging on to see the next revolution, but no one thinks that they will ever change 100% back. Because of this, writers have to be prepared. The more avenues you give yourself for success, the more formats you adopt and adapt to well, the more chances you will ultimately give yourself. The one statement that stuck with me more than any other was: “We are trying to do more with less.” More types of work. Less writers. Attribute it to the economy, to the strike, to the ways of the world; Reps have no choice but to be selective. 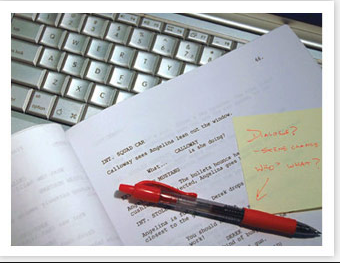 All things being equal, and unless you have the million Dollar screenplay they can easily turn around and quickly sell, when choosing writers to develop and bring into their stable for the long term, reps will likely end up signing the writer who can perform well across multiple formats and therefore create for themselves that many more chances for success.